Looking to buy an electric vehicle, but concerned about charging? First and foremost on most consumers minds when they consider getting their first electric car is about driving range and charging. How do they charge it? Where do they charge it? How long will it take to charge, and how much will it cost to do so? These are all valid concerns, and we’re here to help get you the answers you may be looking for. HEVs are Hybrid Electric Vehicles, which are powered by an internal combustion engine and one or two small electric motors. HEVs do not plug-in to recharge their batteries. Their electric motors are used to support the internal combustion engine, and help make the vehicle more fuel efficient. BEVs are Battery Electric Vehicles, and are 100% electric. BEVs are powered exclusively by their onboard battery and electric motor(s). BEVs need to be plugged in to recharge. PHEVs are Plug-in Hybrid Electric Vehicles, and use both the onboard battery and a secondary combustion-engine system. Some PHEVs have very short all-electric range, as little as 10 miles per charge, while others have as much as 100 miles of electric range before the combustion engine needs to propel the vehicle. PHEVs need to be plugged in to recharge. Can you possibly charge at your workplace? Do you have a long daily commute? Is your driving routine normally predictable? Are you frequently required to make long, unplanned drives that would exceed the range of a selected BEV? Check out all of the currently-available electric cars in the US here, to choose which EVs will fit your needs and desires. Once you’ve decided which EV is right for you, the next thing you have to understand is EV charging. The vast majority of EV charging is done at home - over 80%, in fact. So choosing the right home charging equipment is really important. There are a lot factors to consider, so let’s take a look at some of them. Safety should always be the first concern. Electric vehicle charging is a new industry, and as such there are a lot of new companies trying to get a piece of the market. However, not all of these companies spend the time and money to get their charging equipment safety certified. Our JuiceBox Pro 40 home charging station has been thoroughly tested and has passed every safety test necessary to be UL and cUL listed. Electric vehicles don’t all charge at the same rate. Some can accept more power than others, so they can recharge faster. Usually, BEVs can charge faster then PHEVs, and BEVs with larger batteries can charge faster then BEVs with smaller batteries. EV charging continues to get faster, so the EV you buy today may not be capable of charging as fast as your next EV will. For that reason, it’s a good idea to future-proof your garage. By buying a higher-powered home charging station, you eliminate the need to upgrade in a couple years when your next EV has a higher charging rate. Some of the less-expensive 240 volt, level two charging stations on the market today can only charge at 16 or 20 amps. That may be OK for a small-battery BEV or a PHEV, but many people would fine it takes too long to charge a long-range BEV with a large battery. For that reason, we recommend getting a home charging station that can deliver at least 32 amps. Only a few years ago there wasn’t a choice; all charging stations available had to be hard-wired and permanently installed in your garage. However, driven by customer demand, manufacturers are now beginning also to offer their charging stations as plug-in units. There are many advantages to a plug-in charging station. First, the installation may be less expensive because all you are asking your electrician to do is install a 240v outlet. In many cases, there’s already a 240v outlet available. Besides cost, having the unit plug in also gives it portability. You can take it with you on trips to a summer home, a winter retreat, or anywhere that there’s a matching 240 volt outlet. There’s really no down side to having a plug-in unit other than the fact that unlike eMotorWerks, some charging station manufacturers charge more for their plug-in versions. At eMotorWerks, our JuiceBox Pro 40 is available in both versions, but comes standard as a plug-in unit. So what’s a “dumb” EV charging station? Basically any charging station that has no connectivity, and simply plugs in and charges your car. It doesn’t send you notifications, you cannot monitor your charging session or history, you can’t limit charge rates, and you cannot remotely start or stop a charging session. It simply charges your car, and doesn’t offer any advanced features. This may be what some owners are looking for. They are simple devices, that only do one thing, plug in and charge your EV. However, just like we did for plug-in charging stations, eMotorwerks has been a pioneer for “Smart” WiFi connected home charging stations. All of our products are WiFI capable, and offer advanced features like the ability to monitor your charging session in real time, view your incoming voltage as well as the power being delivered to the vehicle. They also allow the owner to view records of past charging session, so they can calculate exactly how much the car is costing to charge. There’s also more advanced available features like time-of-use scheduling, which can save you a lot of money, notifications and alerts, and even the ability to set the power delivery to whatever level you’d like. Having a WiFi connected charging station can really enhance the overall EV ownership experience. 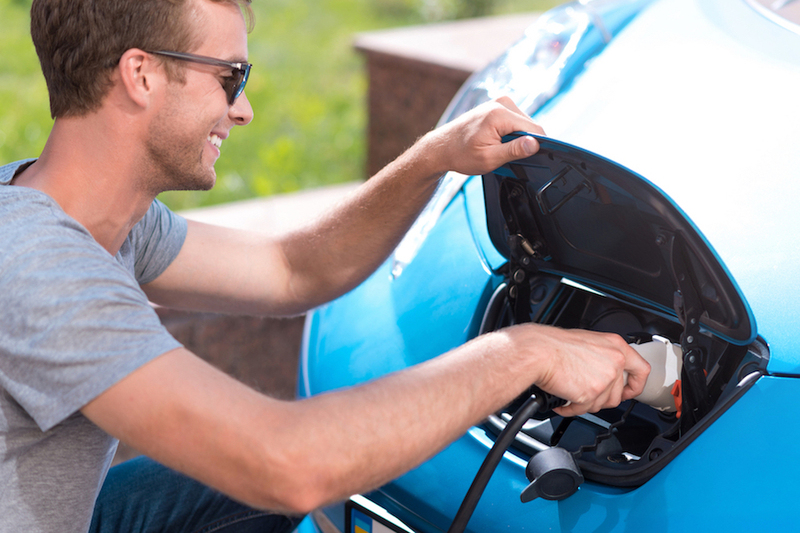 In many cases, the best place to locate a home charging station is outside the home where the owner parks their car. Make sure you get an outdoor rated charging station if you plan on installing or using your charging station outdoors. All of eMotorWerks charging station offerings are approved for outdoor use, and can stand up to the worst weather possible. There are a few smaller considerations that also help to make charging station more user-friendly. Size: There’s really no need for a charging station to be this large device taking up a lot of wall space. A smaller unit is easier to install, easier to carry to another location if it’s a plug-in unit, and is easier to position anywhere that you choose to place it. Cable & Connector Management: Many charging stations simply advise the owner to loop the cable around the top of the unit to store it when not in use. That works, but it’s actually much better when the charging station has a connector holster to plug the connector into when not in use. By holstering the connector, it’s kept dry and contaminant-free while not in use. This is especially important if you are planning an outdoor installation. It’s always best practice to have your connector secure in a holster, instead of just hanging unprotected when not in use. Cable Length: Some “bargain” charging stations come standard with a short cable, sometimes only 16 feet. Many owners don’t realize until they install the charging station that it doesn’t reach the charge inlet of their car unless they back into their garage, or park in a manner that they’d rather not. Make sure you get a cable that’s at least 20’ long. All of eMotorWerks charging stations come standard with a 24 foot cable, which is actually optional on many of our competitor’s units. This allows the cable to reach anywhere in most garages, provided the charging station is centrally located. Last but not least the cost of the charging station must always be a consideration. Home charging station prices vary from about $400.00 up to and even over $1,000.00. However, since the charging station market isn’t quite mature, there isn’t a lot of consistency in value as compared to price. New companies are popping up all the time, and it can be confusing when trying to compare products. For example, one of our competitors has a “40” in their product name as we do. However, our unit can deliver 40 amps (which is why we use 40 in the name) and their product can only deliver 32 amps. By having a “40” in the name many people would assume it can deliver 40 amps, but it cannot. Our JuiceBox Pro 40 is priced lower than most of our competitors, none of which have nearly the amount of features as we offer. There’s a reason why customer reviews place the JuiceBox Pro 40 at the top of its class. We’re proud to be the industry leader in smart electric vehicle charging solutions and look forward to adding you as one of our happy customers.